This was written by a friend and I think it is well done and very instructive. Visit her website. obtaining the information that would make them less optimistic? 5) Understanding the scientific method – how we know what we know –how else can you tell truth from falsehood? 7) A hell of a lot of bedrock knowledge to evaluate new information. cognitive science, cosmology, biology, agriculture, engineering, soil science, medicine and health, economics (history of & natural capital), etc. doesn’t exist over and over again. 11) Having time to read: no children, reading a lot while commuting (including while walking back and forth to work 10 miles a day). 12) Reading BOOKS, which connect the dots (of articles). People who are too busy to get new information beyond TV sound bites will never understand anything important. there’d be a peak in oil production, and doing an interent search on Hubbert. consumer society”. The Bay Area reads more books per capita than anywhere else in the United States, yet these books never appeared in any bookstore in the Bay Area, let alone books by Charles hall, David Pimentel, and others too numerous to mention (see my book list ). Some of these books are at the University of California, Berkeley library, the 3rd largest university library system in the United States, and I’m often the only person or one of several to have read them! But I would have never stumbled on them in the vast stacks, and I didn’t even know until about 6 years ago that the public has access to these libraries for $100 a year. It’s still very hard to find this kind information that contradicts positive articles because negative scientific results are often not published and publishers explicitly state in their guidelines they won’t publish pessimistic books (they’re hard to sell). I continue to find new information in internet forms, but also by reading Science, Nature, and other peer-reviewd journals, as well as the books recommended (Science only publishes their long list of books received online). you want to eat, drink, or drive?”). vowed to stay away from corn ethanol and pursue cellulosic ethanol or butanol from non-food crops. Though that still doesn’t get around all the other problems listed above. But never mind, science researchers got hundreds of millions in funding from BP and other sources, and I think that quietly they’re more looking at how to use plants to replace chemicals and the other 500,000 products made with oil as a component than for fuel. Just because the corn mole was bopped down doesn’t keep the other moles from popping up. Especially annoying is the algal biofuel mole (see 38 reasons Algae will never replace oil ). involved from birth to death involved in this entire process, etc. I think that it’s okay people don’t understand the situation we’re in because there’s nothing that can be done, we’ve so way, way, way overshot carrying capacity locally, regionally, and globally. If people did realize the real situation, the financial system would have already collapsed when Science announced peak oil happened sometime in 2005 and the IEA said peak happened in 2006. That means our economy can’t grow endlessly and the entire credit/debts-payed-off system no longer works. As long as people think other kinds of energy will seamlessly replace oil and don’t know how much their lives depend on oil, civilization continues, and when it crashes, will crash that much harder and faster, perhaps our only hope of preventing our extinction (and millions of other species). I think that it’s okay people don’t understand the situation we’re in because there’s nothing that can be done, we’ve so way, way, way overshot carrying capacity locally, regionally, and globally. If people did realize the real situation, the financial system would have already collapsed when Science announced peak oil happened sometime in 2005 and the IEA said sometime in 2006. That means our economy can’t grow endlessly and the entire credit/debts-payed-off system no longer works. As long as people think other kinds of energy will seamlessly replace oil and don’t know how much their lives depend on oil, civilization continues, and when it crashes, will crash that much harder and faster, perhaps our only hope of preventing our extinction (and millions of other species). A generation of people face depression, despair and meaninglessness as the full significance of the resource constraints of fossil fuels, water, land and food coupled with environmental degradation and overshoot of the global population become a loud noise that can no longer be ignored. This is trauma in the true psychological meaning of the word. Many of us will encounter failed attempts when our efforts of the past produce no viable results. In fact, we will experience a disconnect between the then and the now. We will see no light at the end of the tunnel. Filled with the emotionality of grieving, our anger and fear will motivate our choices, narrow our tolerance and send us searching for scapegoats. Many of us will become entrenched in magical thinking and condemn the unbelieving. Faith is believing that my efforts will give me results. This belief is based on personal experience of previous effective action. It can also be based on the belief that certain actions (prayer, positive thoughts, repetitive behavior) will provide results. It is a belief that the possible can be accomplished. And some times what does not seem possible. These beliefs can be based on direct true cause and effect such as letting go of a china cup will make it fall and possibly break. It can be based on assumed cause and effect such as a drop of coffee falls on the name of a stock in the paper and it goes up that day. Or it can be based on any number of beliefs that are held and continuously reinforced regardless of the statistical possibilities or improbabilities in the known reality. Being without faith is helplessness; it is depression. It is a feeling of not inadequacy but no adequacy. Faith dies when previous actions do not solve. It is not being able to change/control the circumstances or environment or behaviors that in the past seemed to be changeable/controllable. Depression has been called anger turned inward. If it were turned outward it would be aimed at the circumstances/environment/behaviors (persons) that are creating the feeling of helplessness. Depression is related to the past. It arises when all our adaptations fail to be effective. The energy of depression is pervasive, a mood and in the gut. Hope is based on positive possibilities for the next minute, day, year. It is fueled by a belief in a just world. 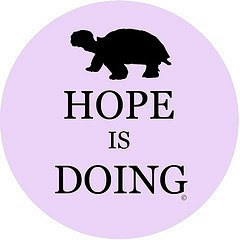 Without hope there is despair. It has to do with the future. It is a fear of a continuation of the present situation. It is same old, same old. It is also the feeling that there is no freedom from the repetition of the patterns of adaptation. These patterns are unsuccessful in getting our needs met and they will go on and on and on. So the future is bleak and hopeless. Charity is about relationship with the self and other. Too much self is filled with greed and amorality. Too much other enables without discrimination. To the self, charity is giving and caring not in gluttony but in honoring. Charity to others strengthens all the communities of the web we live in. It is experiencing the oneness of being. The oneness can guide us but we must live in the webs of our particular life and recognize the boundaries. Charity is being gentle. It is about balance. It is the challenge of knowing when each is needed. Without the fullness of charity, being is meaningless. Without being connected, we live in an angst of aloneness. Depression rises out of the gut from the energy of a failed past and flows into the head dampening action. Despair arises out of the mind because the idea of a future is in the head. Despair flows into the gut dampening the emotional energy for action. Charity is the connection to the heart. The heart without meaning is meanness to self, it is meanness to others. As humans, in the process of becoming, we learn faith, hope and charity particular to our human world. They can be learned in narrow, restricted, restrictive, and self-defeating ways. The first half of life is learning these ways of being and then working diligently to express them: we actually create/define the world to reinforce them. The second half of life, with enough experiences to see the patterns, is filled with finding our faith, hope and charity. Without it we become trapped in the arising experiences of depression, despair and meaninglessness. The splitting of the wood was necessity. It was necessary doing connected with hope. The speaking with students all around Central and Northern Minnesota, the billboards and the T-shirts with the picture on it arose in me and had a life of its own. It was hope doing me. I would like to have lights. Having lived off the grid for 30 years, ten of which was without electricity, I would like to have lights. During the ten years without electricity, I got my lights from kerosene lamps. I got a masters degree in psychology using kerosene lights. The experience taught me the old saying, “a place for everything and everything in its place” because a kerosene lamp doesn’t give off a lot of light. I love to read and I did okay. I can’t make kerosene. I could make oil from various plants by pressing them. Whales are scarce in Northern Minnesota so that option is out. So I thought I might make an electric light. Below find an image of an electric light and its components from a mining company. It is fairly clear I won’t be making a light bulb anytime soon. 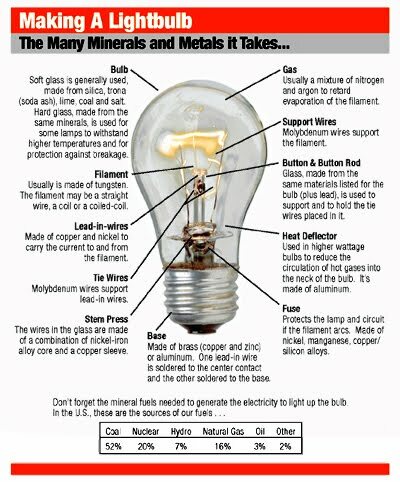 There are many minerals and much energy to extract, process and manufacture those minerals that without fossil fuels will make if very difficult. Thirty years off the grid and not one second of that time was I disconnected from the fossil fuel world. For twenty years, I had solar electric panels and wind generation with batteries and various electronics. Each and all of these were products of the fossil fuel world from the raw products in the ground to the finished product in my home. There are paper plans that propose that solar electric panels, solar focused steam, wind, biofuels, etc. can make enough energy to reproduce themselves. I say do it. Make a demonstration project of tons of various materials extracted, processed, manufactured, transported and installed using only “renewable” energy. Oh, and then make a light bulb with the extra energy you have. I want lights. “Got thinking about this morning. Supposing a wife tells her 6 pack a day husband that he is going to die from lung cancer or emphysema? Is she a doomer? Or is he perhaps the doomer as he is continuing to do things that may doom him to an early death? Is a scientist who warns of global warming a doomer or are the dirty coal burning factories the true doomers? Is someone who warns of the dire possibility of collapsing more and more fisheries a doomer or are the factory fishing boats the doomers? Are the people who warn about building nuclear power plants on fault lines doomers, or are those who build them there the doomers? Would living with less energy in Japan be a worse doom than Fukushima? The other thing I would like from electricity is a 1/2 hp motor. It can run many things – pump water, grind grain, power a vacuum cleaner, etc. I think making a 1/2 hp motor will be just as daunting as making an electric light bulb. This is the reality of a world without the gift from life past, time and the pressure of the earth in the form of fossil fuels. It will be here tomorrow. Slowly (maybe not so slowly) becoming obstinate, perverse, eccentric, and mad.